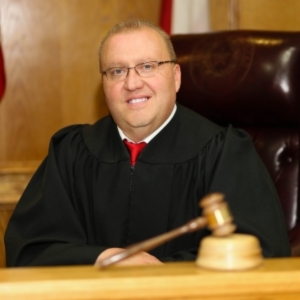 HOUSTON (CN) – A Texas judge who opens his court with a prayer each day puts fear into lawyers who believe that if they object it could spell trouble for their clients, two attorneys claim in a constitutional lawsuit. Defendant Wayne Mack is a justice of the peace in Montgomery County, with jurisdiction over minor misdemeanors punishable by up to a $500 fine, and civil matters with not more than $10,000 at stake. Montgomery County, just north of Houston, is one of Texas’ fastest-growing counties, with new homes being bought up by people who want easy access to Houston with breathing space to enjoy the county’s dense pockets of piney woods. Montgomery County has no coroner. Its justices of the peace serve that role and are called to the scene of fatal accidents. Mack felt overwhelmed assessing an accident scene while tending to distraught family members of the deceased, so he recruited a group of volunteer chaplains to counsel them within weeks of taking office in May 2014, according to the lawsuit and an August 2016 advisory opinion from Attorney General Ken Paxton that said Mack’s courtroom prayers are constitutional. To reward the chaplains for consoling grieving families, Mack lets one of them lead a prayer in his courtroom each day before he starts his docket. The Freedom From Religion Foundation, a Wisconsin-based nonprofit, and Montgomery County attorneys Jane Doe and John Roe sued Mack on Tuesday in Federal Court. Both have appeared before Judge Mack. Their atheist co-plaintiff Jane Noe says in the complaint that she appeared for a case in Mack’s courtroom and endured a sermon from a chaplain who read from the Bible for five minutes, then asked everyone to bow their heads for a prayer. Though Mack’s bailiff announces that no one’s case will be affected if they choose to leave the room and wait in a hallway during the prayer, the plaintiffs say they stayed put. “Ms. Noe felt coerced to remain in the courtroom during the opening prayer, lest her absence from the courtroom bias the judge against her,” says Noe, who is a member of the co-plaintiff Freedom From Religion Foundation. Attorneys Doe and Roe say they regularly work in Mack’s courtroom and in the interest of their clients they feel compelled to bow their heads for the prayer. “Judge Mack seems very interested in people’s body language during the prayers,” Freedom From Religion Foundation attorney Sam Grover told Courthouse News on Wednesday. In addition, the plaintiffs say, Mack is the only judge in the area who locks his courtroom doors. “To exit, a person must push a button and reentry can only be granted by someone already inside the courtroom. Those seeking reentry after the prayers would need to draw attention to themselves by knocking on the courtroom doors,” the complaint states. The lawsuit follows up on an October 2014 complaint about Mack the foundation made to the Texas State Commission on Judicial Conduct. That complaint led the commission to call a hearing where its members questioned Mack about his chaplain program and courtroom prayers. The commission dismissed the complaint. It did, however, send Mack a letter urging him to discontinue the chaplain counseling program and the courtroom prayer. Chelsey Youman, staff attorney for First Liberty Institute, a Texas law firm focused on religious freedom, represented Mack before the commission. She explained why Mack locks his courtroom doors in an email Wednesday. “Judge Mack’s court deals with family issues, which include many highly emotional cases. For the safety of all attendees, the court has implemented security procedures to make sure that anyone who comes into the courtroom has been through the appropriate security process,” Youman wrote. Lt. Gov. Dan Patrick, a devout Christian and one of the state’s most influential politicians, came to Mack’s defense, asking Paxton in a February 2016 letter to issue an advisory opinion on Mack’s chaplain programs. Patrick wrote that the courtroom prayers do not raise the possibility they will affect Mack’s treatment of litigants because Mack closes his eyes for them. Paxton also sided with Mack. His nonbinding opinion cited Town of Greece v. Galloway, a 2014 decision in which the Supreme Court ruled 5-4 that volunteer chaplains can say a prayer to open the Upstate New York town’s board meetings. Mack graduated with a theology degree from Jackson College of Ministries, according to the lawsuit. Mack told Courthouse News last year that more than 50 chaplains. representing 30 faiths and denominations, are involved in the program, including a rabbi and Hindu elders. “Mack has had Christian, Jewish, Muslim, Mormon, Hindu, and Church of Christian Science leaders participate in the chaplaincy program. Christian, Hindu, Mormon, and Church of Christian Science leaders have given the invocation. Additionally, an atheist person asked if he could participate in the program and was told that he could, but the atheist person never showed up for the training,” Youman said in an email. But Grover, the foundation attorney, said that most chaplains who lead the prayers are Christian, and that’s beside the point. “Our Constitution protects against government endorsement of one religion over another, but also religion over non-religion, so the mere endorsement of religion in general through a prayer practice is unconstitutional when it’s led or endorsed by a judge,” he said. Grover said he did not know of any instance in which Mack showed explicit bias against someone who declined to participate in the prayer. The plaintiffs seek declaratory judgment that Mack’s courtroom prayers violate the First Amendment and an injunction. They are represented by Grover and Patrick Luff in San Antonio.